So I planted a few dozen seeds and faithfully watered them every few days even though it took about a month to see the first green buds breaking the earth’s surface. After another week or so, I thought, “These are getting close to two feet tall—the flowers should burst forth any day now.” Only that’s not what happened. The 2 feet tall stalks quickly turned into 4 feet which soon turned into 6 feet and before I knew it, these gargantuan botanical specimens were towering over me at a robust 9 feet tall! Now, I had long since thrown away the package, but here’s what I figure must have happened. 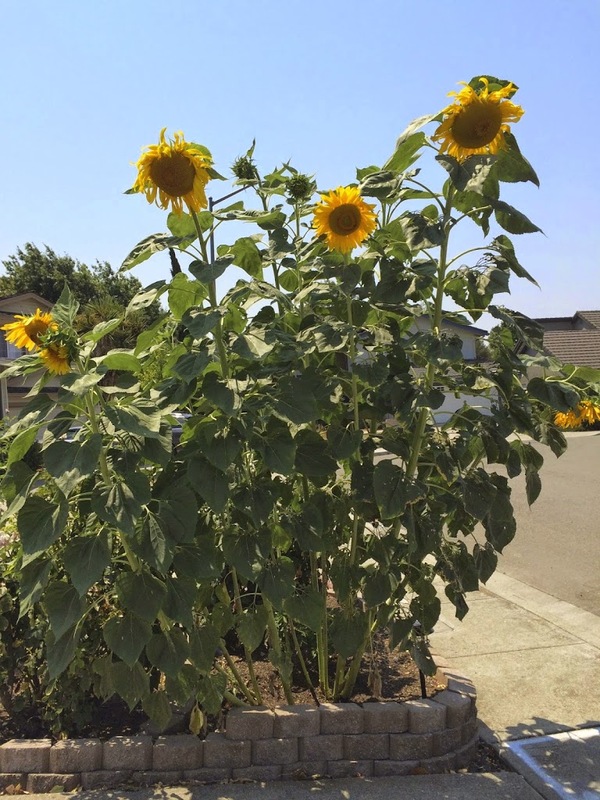 What I thought read “the plants will be two feet in height” must have actually read “the sunflowers themselves will be two feet wide!” Here’s a picture of our “miniature sunflowers” taken just yesterday! If you look carefully, you can see our 4 feet high rose bushes that are now lost in our sunflower jungle. In the midst of being able to laugh at myself (it’s very important that we not take ourselves too seriously! ), I thought about what God has to say about sowing and reaping. Son, sowing and reaping isn’t about expecting to get an immediate return. Nor is it about getting back what you put in the ground. You placed a few dozen seeds that fit into the palm of your hand into the ground. You had a hopeful, expectant heart, and you thought you knew what the outcome would be. But as you waited a miracle was happening underground that you could not see. For a time, it seemed as if nothing was happening. Then out from the ground burst life, but not in the same measure to what you placed in the soil. No, you received abundantly more than all you could ask or imagine. You received a full measure, pressed down, shaken together and overflowing. You sowed sunflower seeds, so out from the ground came sunflowers, but each seed you planted produced hundreds more seeds. This is my heart. This is my Kingdom. This is why I want my children to sow good seed–seeds of love, forgiveness and generous giving. And I will make certain that what they release will come back. When they choose to love, the love returns. When they live a life of forgiveness, they are more readily forgiven by others. When they give with a generous heart, it comes back to them. Not instantly. Not on the same scale. No, I’m much better than that and you can fully trust my exceptionally good heart for you!